When you’re debating whether or not to attend an out-of-town event, the last thing you want to worry about is hotel prices. Nobody likes booking a hotel room only to find out that the price dropped. UGH! ABCey came across a new service called Tingo, which automatically gives you a refund if the price of your hotel room drops. As event planners, this is something great to recommend to guests and invitees of your events. A TripAdvisor subsidiary, Tingo aims to prevent those frustrating phone calls to the hotel or booking company trying to get reimbursed. Many times, conferences and popular events will offer you hotel deals. 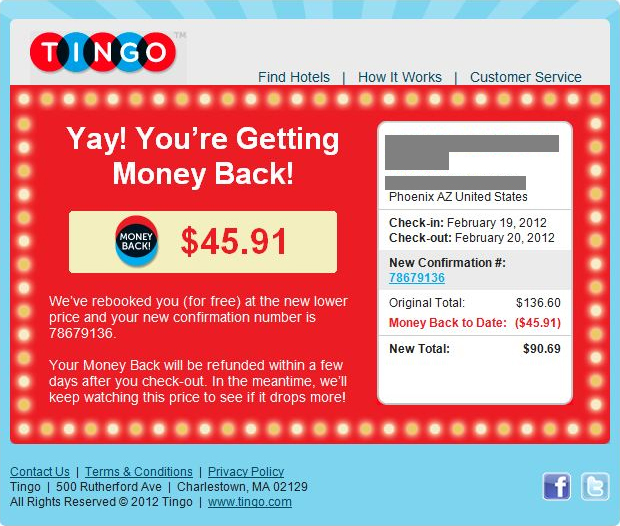 If, however, the designated hotel is all booked up you may rely on Tingo to get ultimately get you the best deal. For example, if you’re attending a weekday event in New York City, they saw prices drop at an average of almost $40 within a 30-day period. Here for a wedding in San Francisco? 136 hotels dropped an average of $52. Clearly, there is money to be saved and with this tool you just might be able to convince that hesitant event guest to attend your event! Furthermore, why waste that extra money when you can spend it elsewhere and enjoy the city you’re visiting a little bit more? Let us know if you’ve had any experiences with Tingo or if you’re going to give it a whirl in the comments below or on Facebook & Twitter. Time is of the essence in the event industry, and every second that can be saved counts. Startups and apps that aim to capitalize on our busy lives are making a killing off of our need for the fastest, most efficient version of whatever service they provide. Our cell phones have become a tool that we cannot seem to live without because of their capability to connect us to a world filled with these amazing, time-saving products and services. So what happens when your beloved smart phone is out of commission, and you simply don’t have the time to send it away for days, or even weeks, to be repaired? You need only to remember one brand new service: iCracked. iCracked is the newest way to fix your precious iPhones, iPods, and iPads. Like many other companies, iCracked started in the dorm room of college students. These students decided they could no longer afford those pricey screen repairs necessary after multiple plummets from hand to floor. You know, those lovely accidents that leave you with a phone screen resembling a spiderweb. The people at iCracked replace broken screens, LCDs, batteries and all other parts, as well as repair water damage for all iPhone, iPod Touch, and iPad models. Here comes the convenience and time-saving part: iCracked’s iTechnicians can meet you in your own home or office to perform any repairs that you might need, usually taking only about 30 minutes to complete the job. They’re definitely not joking about saving you time! We love that iCracked offers such a quick fix to the common iPhone mishap. We can see this service being super helpful when in a bind while preparing for events and needing all of the precious info we keep on our phones! 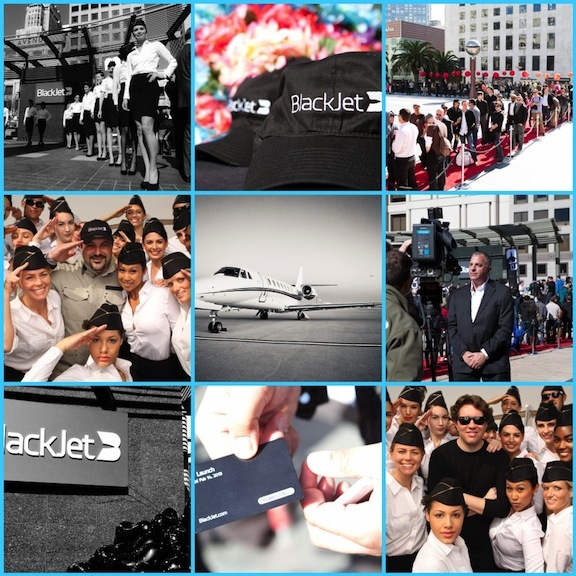 Tell us what you think of iCracked in the comments below or on Facebook & Twitter! 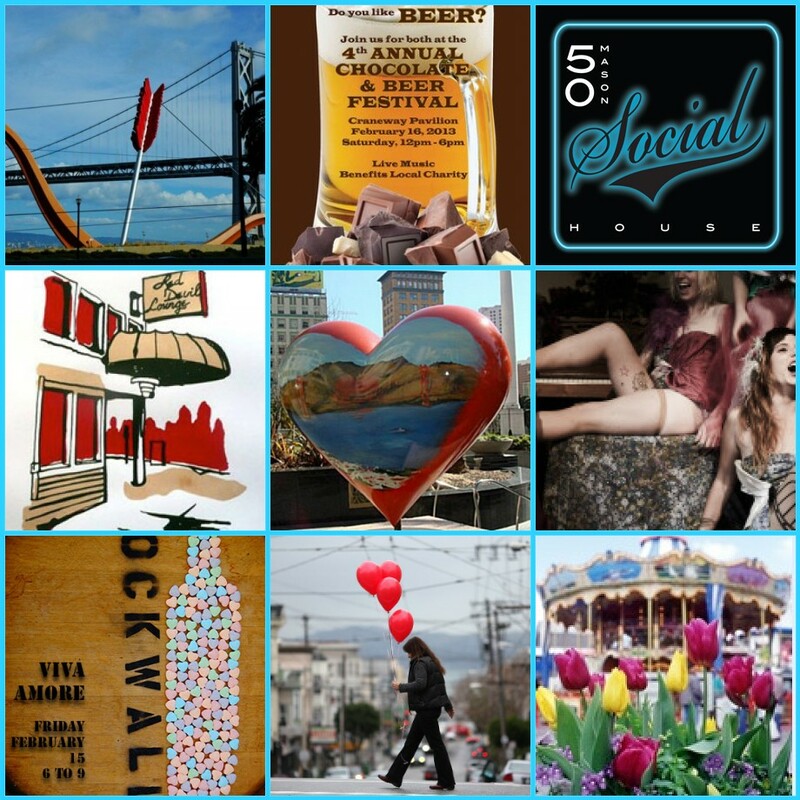 ABCey has got another round of great events for you to enjoy in San Francisco this weekend. 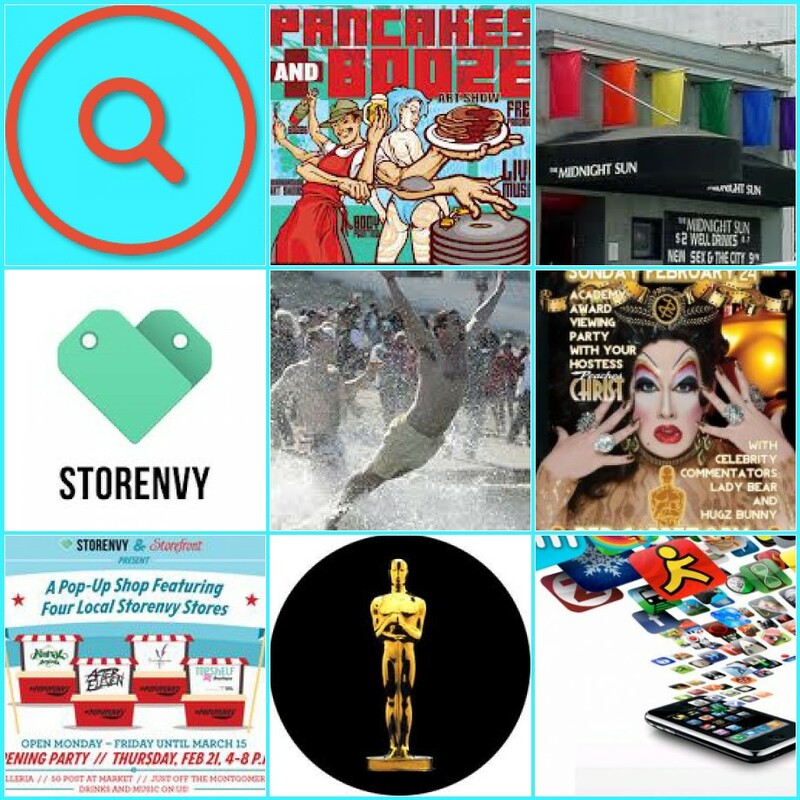 From Pop-up stores to the Polar Plunge, there’s always a variety of fun experiences to check out! 2. Intro to Mobile App Development | 2.21 | Sandbox Suites – 567 Sutter St | Learn to make mobile applications is simpler than you think! The course will review the technologies being used in making applications and give you enough guidance for you to decide what the best strategy for you is for making an application. This is a beginner level class and can be of assistance to you if you don’t have any background in programming and are interested in building an app. It is also very helpful to those interested in or are currently working with programmers. 3. Pancakes & Booze Art Show | 2.22-2.23 | Bar 4N5 – 863 Mission St | LA’s Underground Art Show has made a home in San Francisco and is coming back February 22-23, 2013 for another two day run at Gallery 4N5. For a $5 cover charge expect to see the works from over 75 underground and emerging artists, live body painting, live audio and visual effects, a photo booth, a no-host bar and most importantly, an all-you-can-eat pancake bar. Enjoy live audio and visual performances byXpander Xperience, Matt Sabotage Nakamatani, KC Patterson, Joshy Nightshift, and Andy P.
4. 2013 Polar Plunge | 2.23 | Aquatic Park, Crissy Field| Come down to Crissy Field on February 23, 2013 and delight at watching other people freeze their tail ends off by taking a plunge in the bay with all proceeds going to the Special Olympics of Northern California. Unlike the Escape From Alcatraz triathlon, these hundreds of brave souls won’t be swimming, just braving it—some in wacky costumes—for a quick, but agonizing dip in the chilly waters of the SF Bay. For those too chicken for a plunge, they’ll be sent to the “Chicken Coop” so be sure to wash them with ridicule… and donate a buck to their cause while you’re at it! 5. 2013 Oscars Bash with Peaches Christ | 2.24 | The Midnight Sun – 4067 18th St | Join Peaches Christ and celebrity commentators, Lady Bear and Hugz Bunny on the red carpet for the ultimate queer super bowl, the 2013 Academy Awards on February 24, 2013. From the pre-show fashion parade to the crowning of the “Best Picture” Oscar, the on-hand drag commentators will be emceeing the awards ceremony, sharing opinions and providing recaps during the commercial breaks all night long. This will be a live viewing party and guests are encouraged to dress to impress for the “Oscar Character Costume Contest” – Django couture, Mary Todd Lincoln Realness, Black-tie OBL, Drag Of The Southern Wild. Which of these events will we see you at? Let us know in the comments below or on Facebook & Twitter! Many of us have experienced the struggle to communicate with bosses, coworkers and contractors because we’re all not in the same spot at once. We’ve recently come across AnyMeeting here at ABCey, your new best friend for online meetings or conferences and specially tailored for small businesses! 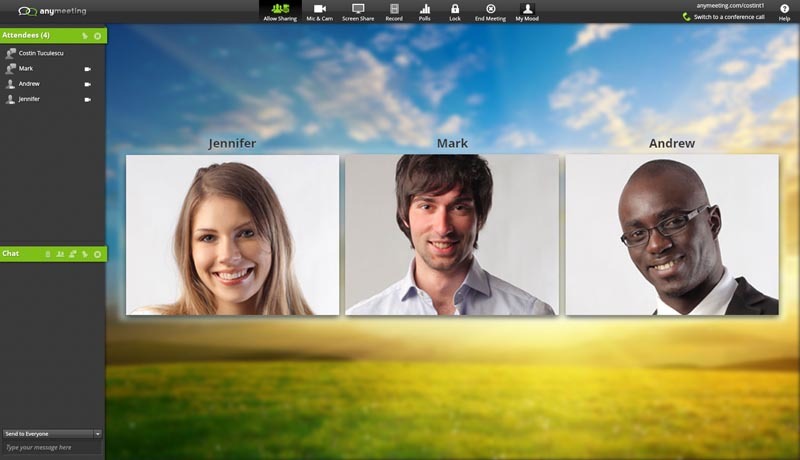 Any Meeting is super easy to use, so even first-timers will be able to find their way around the software. Users can host an unlimited number of webinars with up to 200 users per session, and several options are offered for presenters to engage with their audience. They include status updates, chats, polls and the ability to send links which will pop up your screen. There is no client software to install, which means no last minute scrambling to join the meeting. Let us know what you think of AnyMeeting and if you plan to give it a try! Leave us a comment below or on Facebook & Twitter. How often do you find yourself needing to make last minute hotel reservations? Maybe the place you booked in advance has lost your reservation, maybe you didn’t book anything at all, or maybe you just want to be impulsive and go on a spontaneous trip to Vegas! There are plenty of reasons as to why it would be convenient to have a resource that could help you find a hotel room for that very evening. 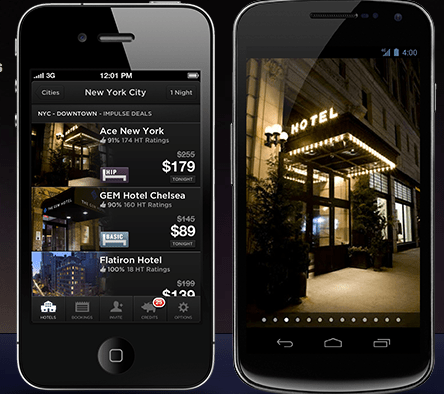 The folks at HotelTonight have created an app to help you with just that! Currently available in 10 countries and over 80 destinations, HotelTonight makes it easy and simple for you to book same-day unsold hotel inventory, providing you with some really great deals that otherwise would not have been available to you. You can even make a reservation all the way up until 2am, a convenience that is not usually offered at most hotels. Considering we all use our mobile phones to do pretty much everything, HotelTonight is a must-have to add to your army of apps. It’s a win-win for everyone in this situation! You get convenience and great value for your sporadic trips while hotels get the opportunity to sell last minute rooms that would have otherwise remained empty. What a great tool to use when making those impulsive decisions to attend that conference in San Diego or to show up at that event in Chicago that you just didn’t think you’d have time to attend. If we’re ever in need of last-minute rooms for any of our clients from out of town, we know what app we’re using! 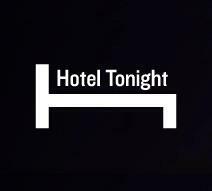 Have you ever used HotelTonight? Let us know how it made your trip more convenient in the comments below or on Facebook & Twitter!